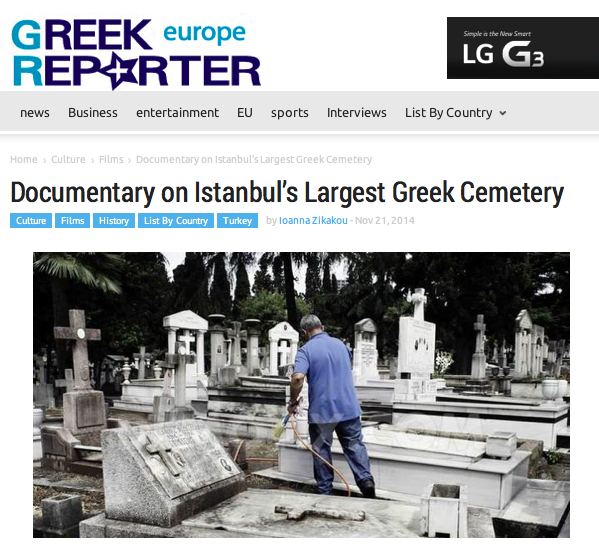 A documentary on Şİşlİ Greek Orthodox Cemetery, the largest Greek Orthodox cemetery in Istanbul, will be screened for the first time at Lütfi Kırdar International Convention and Congress Center on Friday, November 21. The event is organized by the Ecumenical Patriarchate, in collaboration with Beyoğlu Greek Society. The documentary, entitled “Those who Depart this World, Die Only when Forgotten” (“Bu Dünyadan Göçenler, Yalnız Unutulduklarında Ölürler”), is directed by Angeliki Aristomenopoulou, written by Nikos Mihailidis and narrated by Sia Kosioni, while the music was composed by Mimis Plessas. Many Greek and Turkish historians, such as Vlasis Agtzidis, Dimitris Frangopoulos, Elena Papageorgiou, Professor Ayhan Aktar of Bilgi University, as well as Ecumenical Patriarch Bartholomew, appear in the documentary. . . . In recent years, the Ecumenical Patriarchate in collaboration with Beyoğlu Greek Society Foundation have been conducting a restoration project in 40 Greek cemeteries that stand out for their historical value. . . .